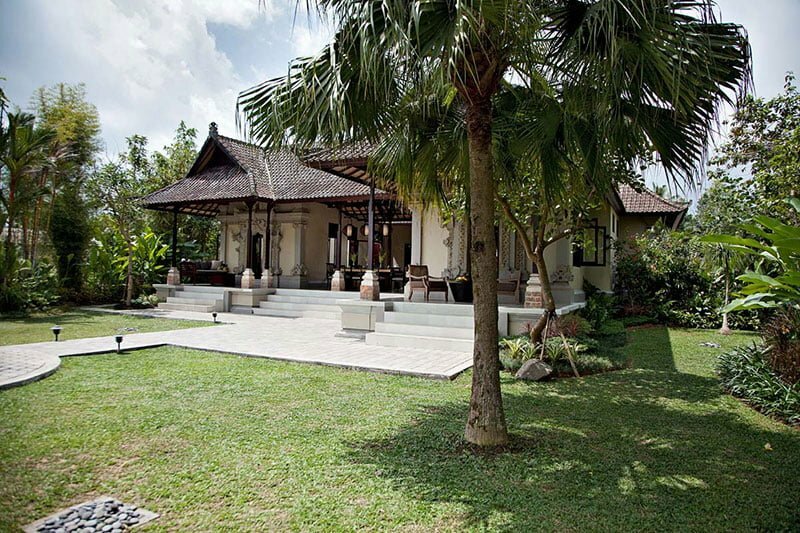 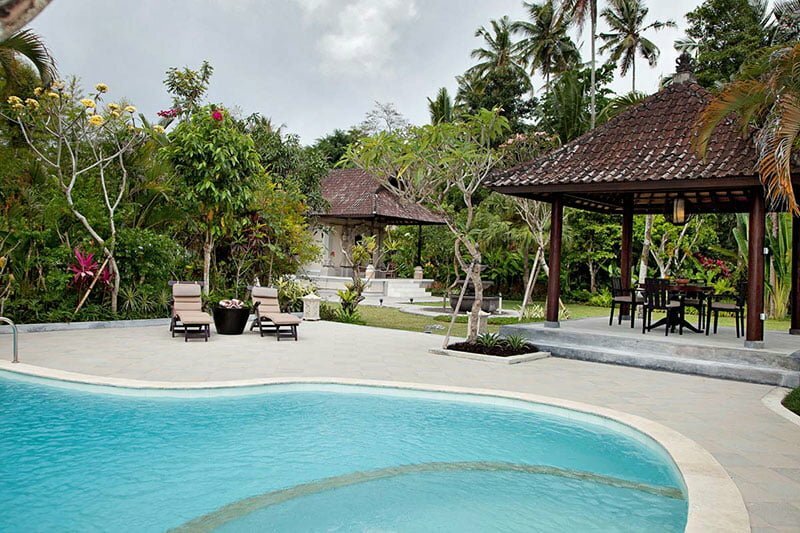 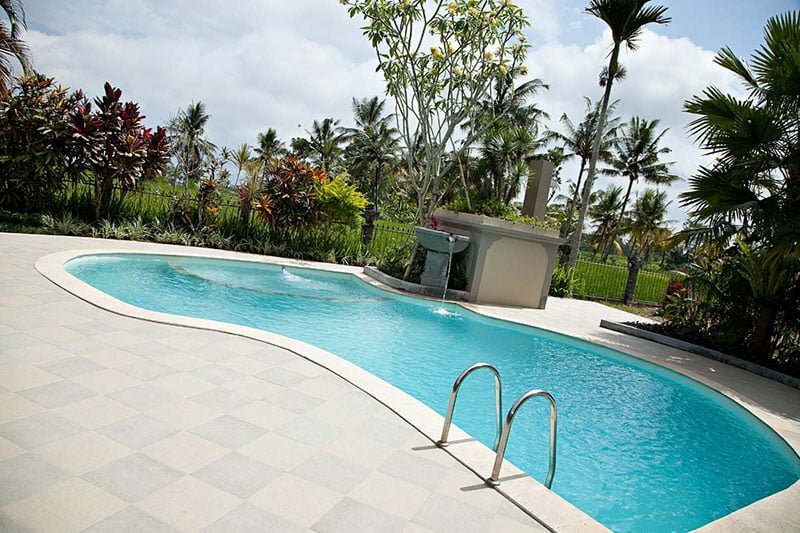 Villa Cemadik is a 3 bedroom tropical holiday home nestled in the peaceful village of Pejeng, Banjar Pesalakan. 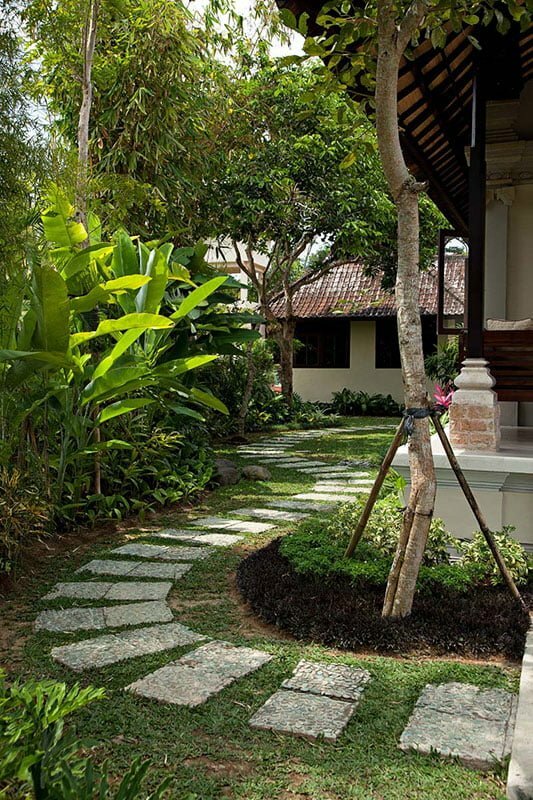 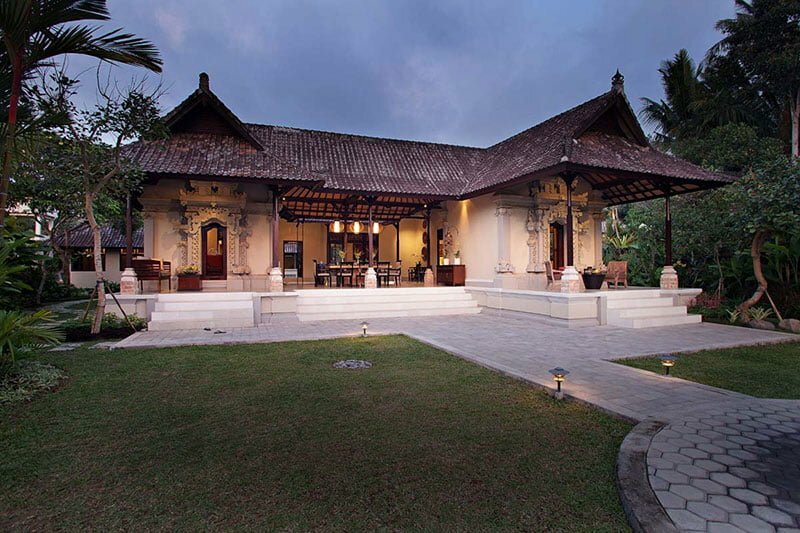 This beautiful villa offers the perfect serene retreat in a picturesque landscape amidst green rice fields. 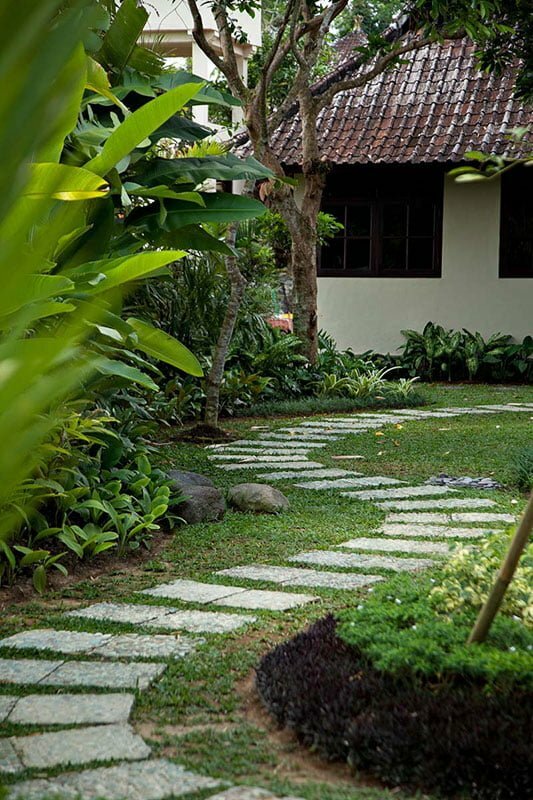 You get to stay close to nature and away from the stresses of modern city life. 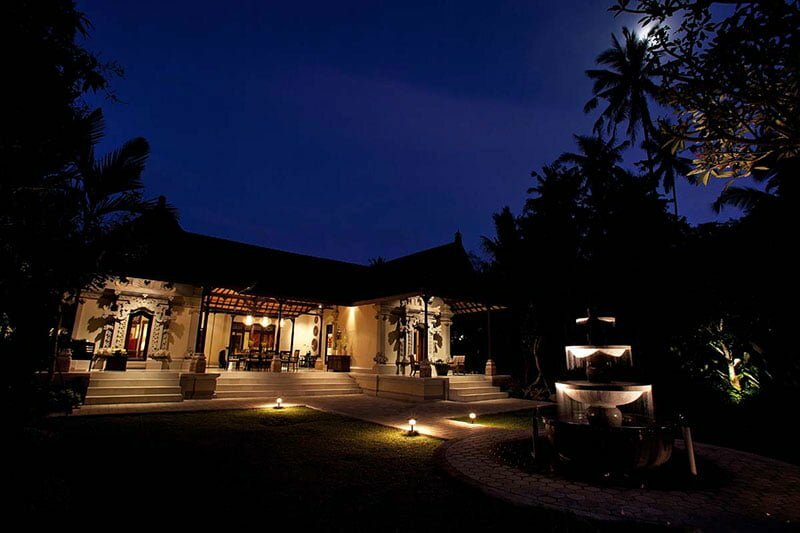 While the villa is tranquil and secluded, it provides easy access to the best spots and attractions in Ubud including the Goa Gajah Elephant Cave. 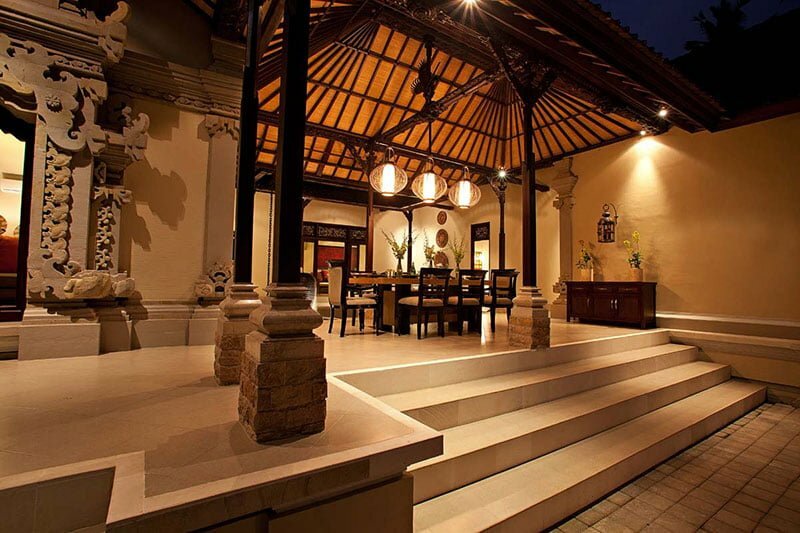 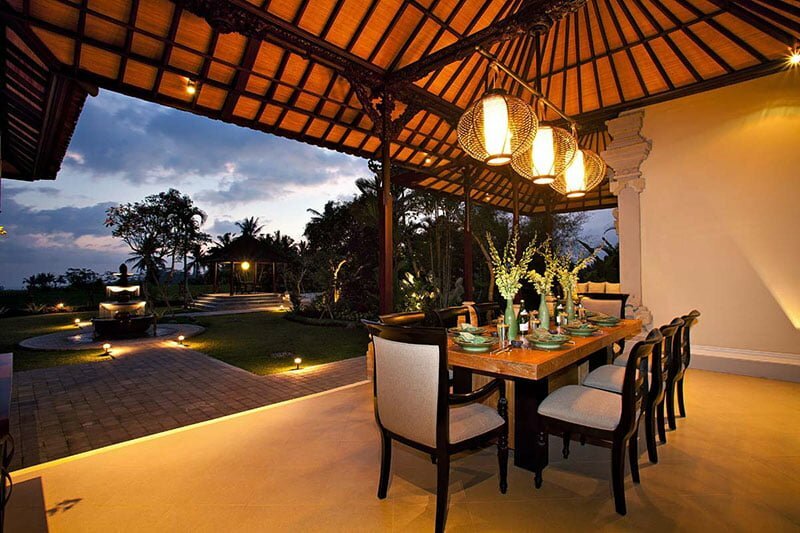 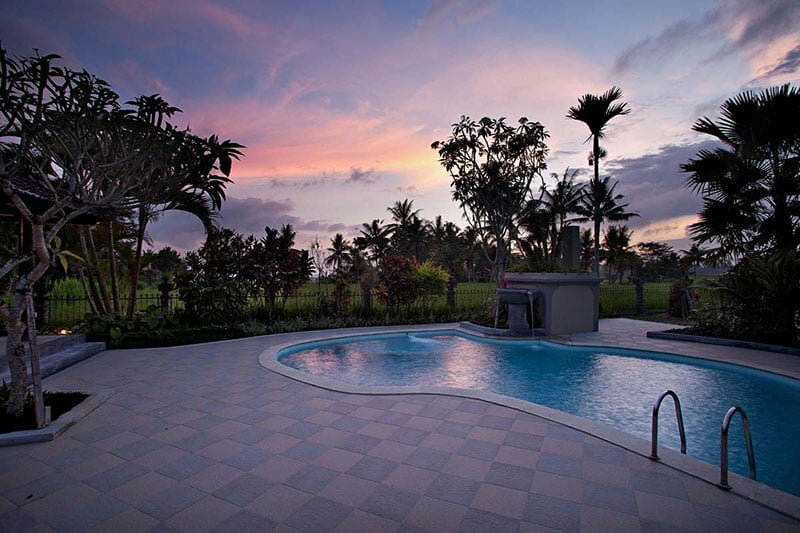 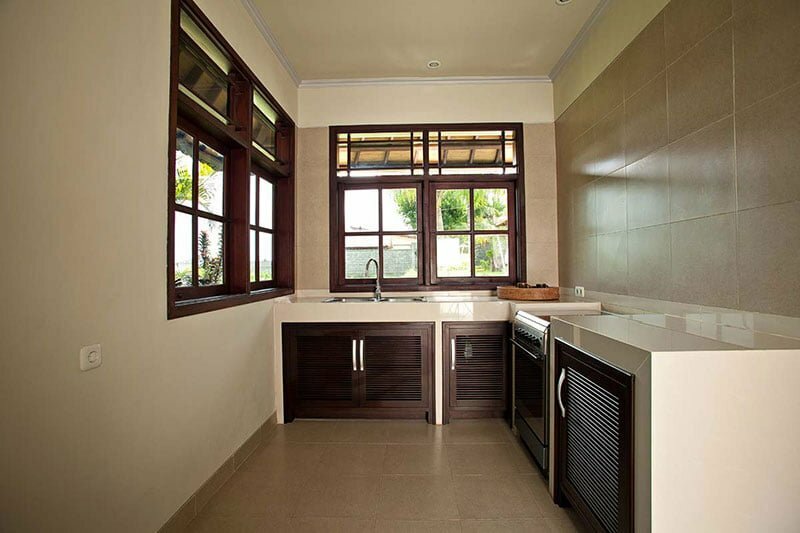 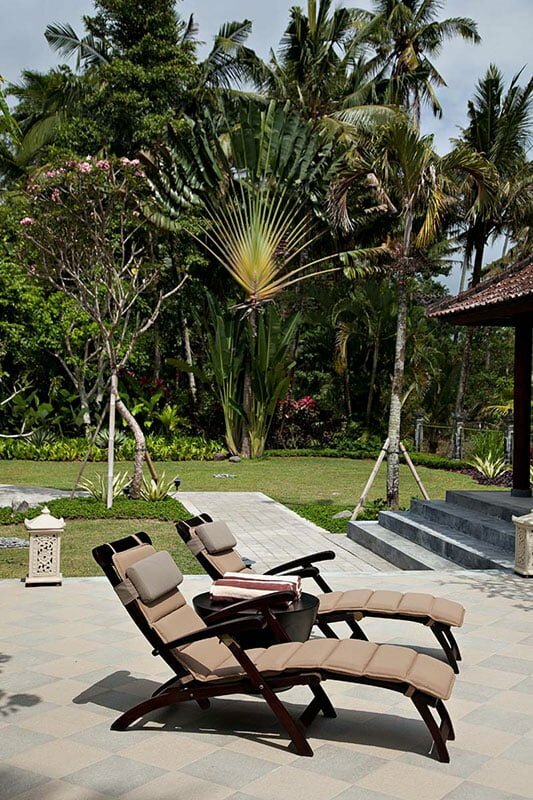 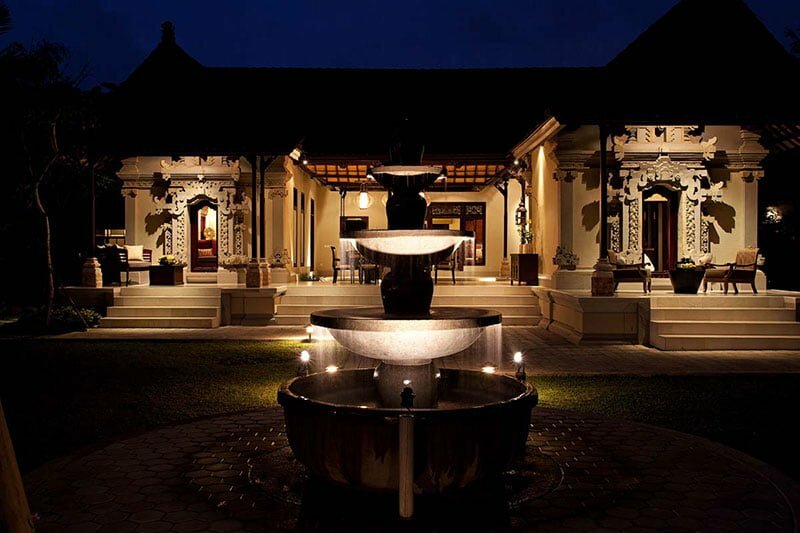 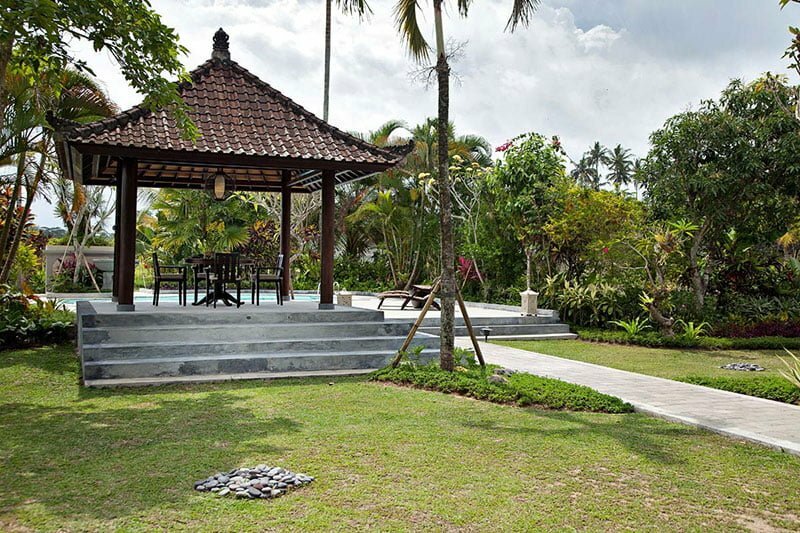 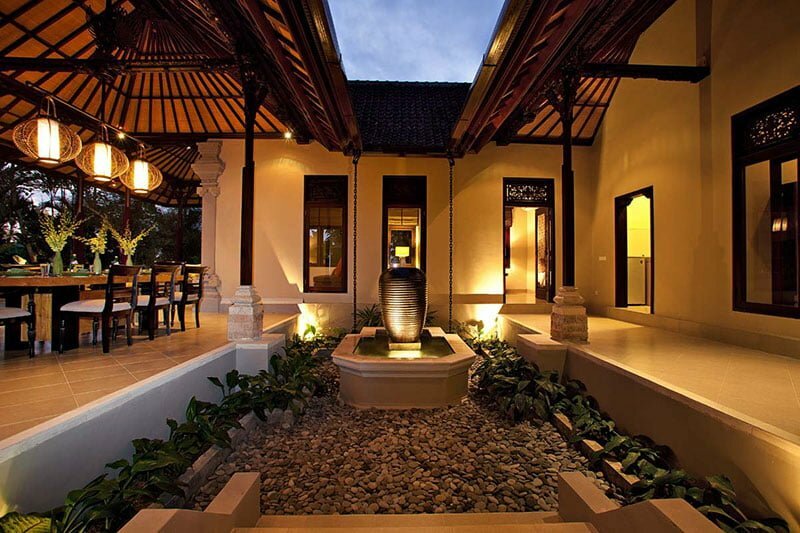 The villa’s tranquil and serene location demonstrates the true spirit of Bali. 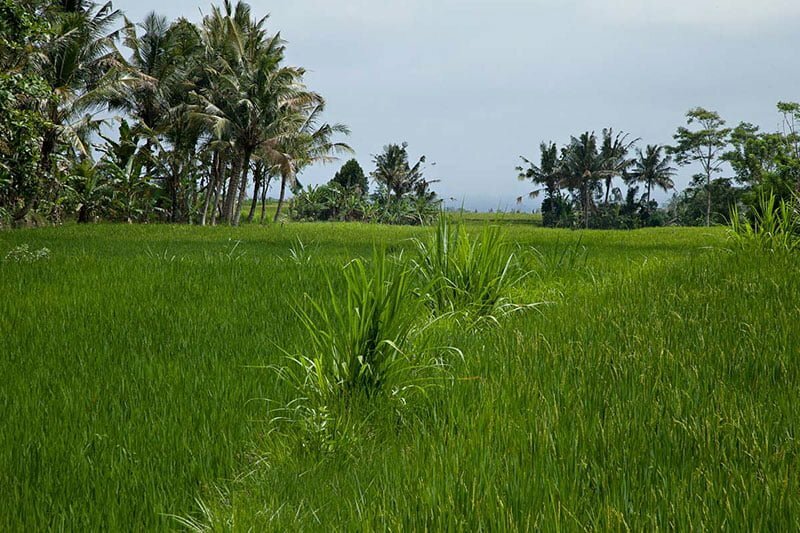 You can take in the untouched natural environment, view the expansive rice paddies and visit the traditional local village temples. 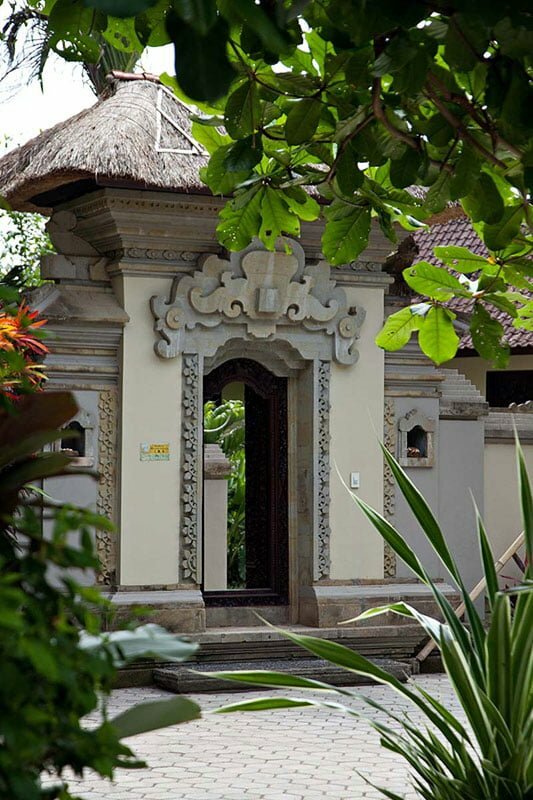 The close by amenities and spots include the Goa Gajah Elephant Cave, Ayung river water rafting and traditional Balinese villages. 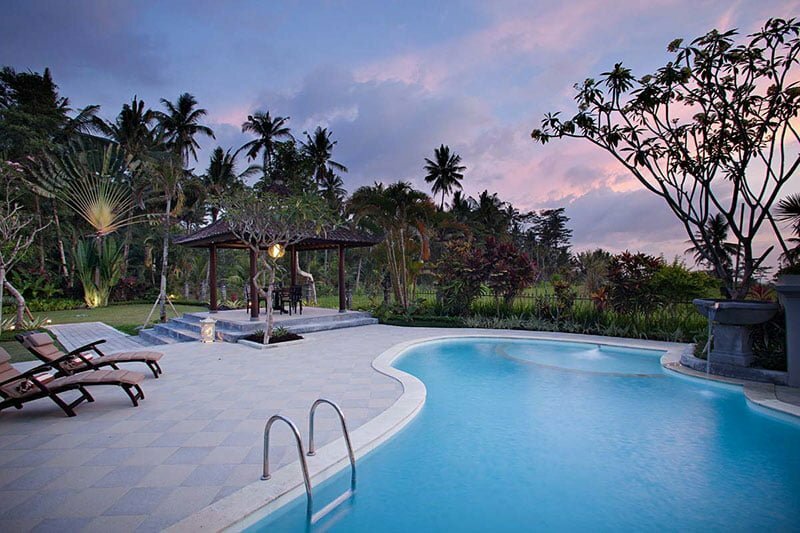 Ubud’s center is just 10 kilometers away. 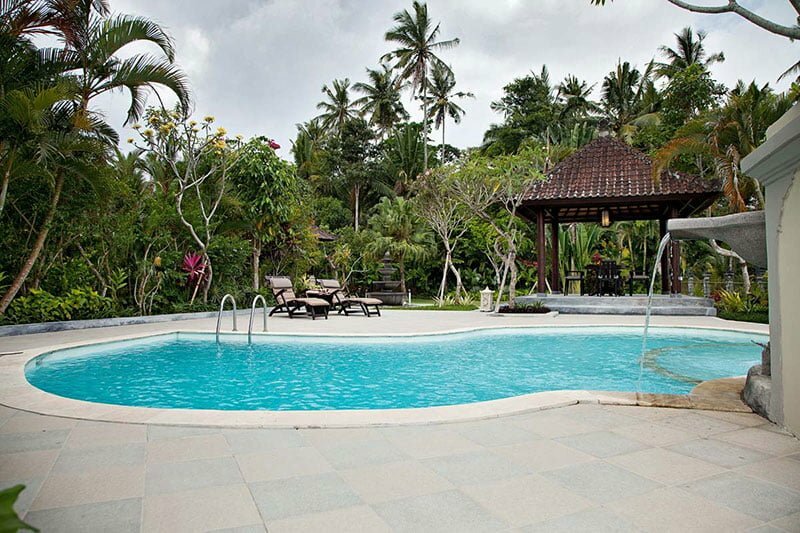 Villa Cemadik boats of a beautiful and well-maintained tropical garden complete with tall palm trees, luscious plants and foliage, and frangipani trees. 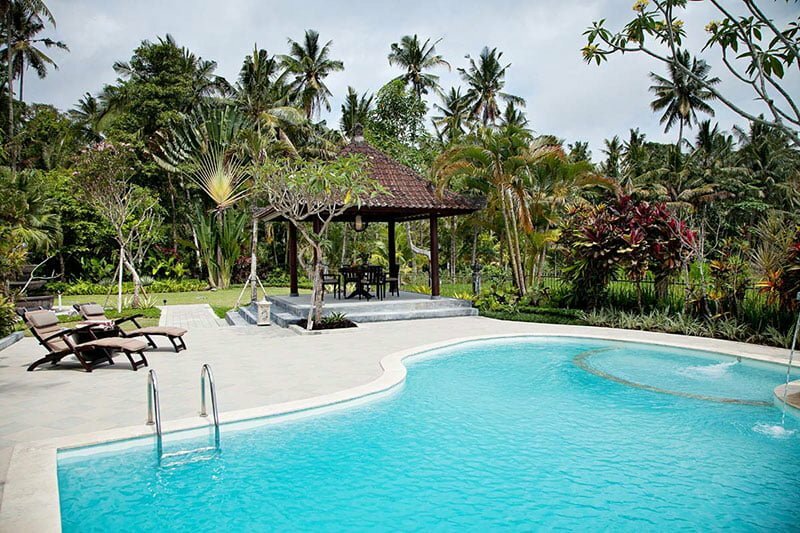 The garden encircles a lavish lagoon-style curvy swimming pool. 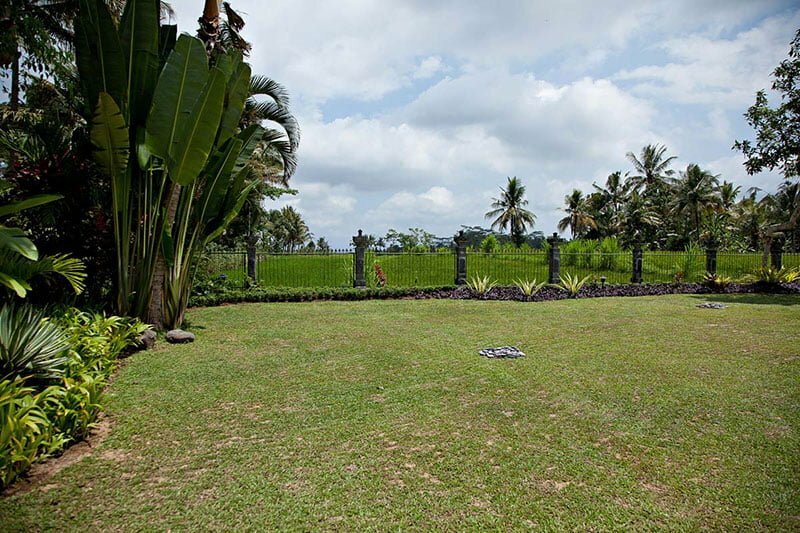 From the garden, you have a stunning and expansive view of the rolling rice paddies that surround the villa. 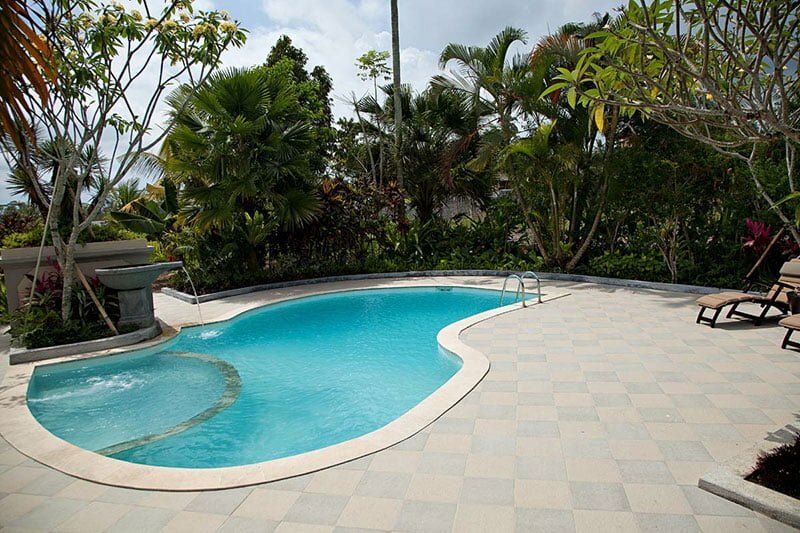 The pool has a stone deck that has sun loungers where you can kick back and catch a tan while enjoying the sound of the water fountains. 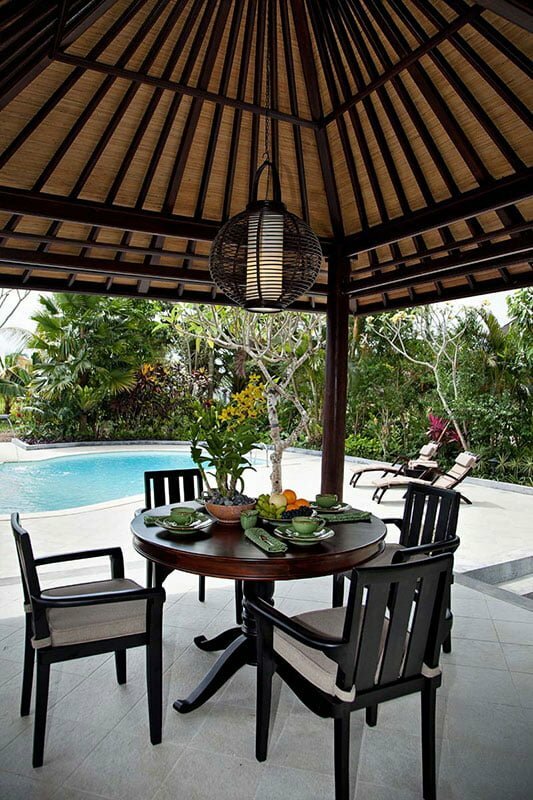 The outdoor area also has a shady traditional Balinese bale that is ideal for tropical alfresco dining while you view the beautiful tropical surroundings. 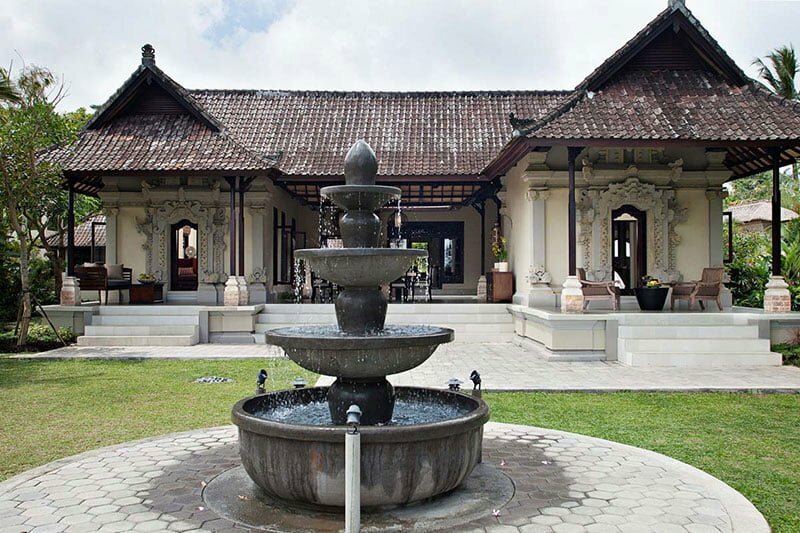 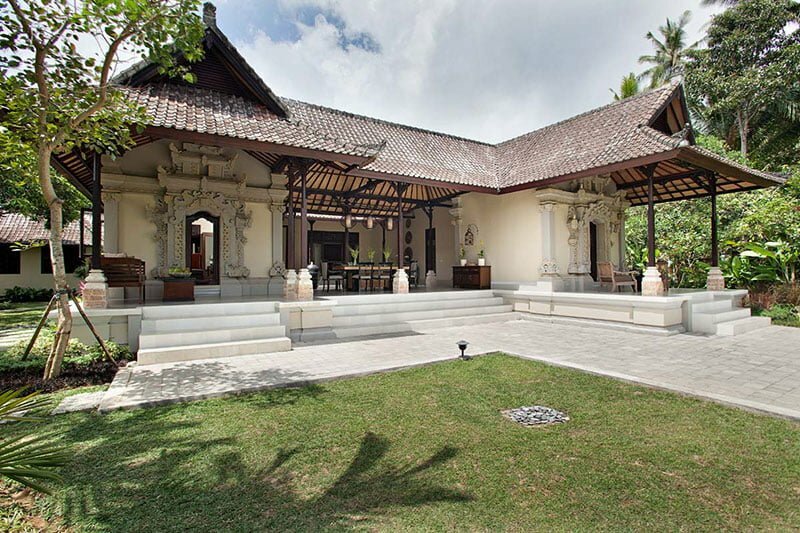 The villa has a traditional living pavilion with high rooftops and unique Balinese doors. 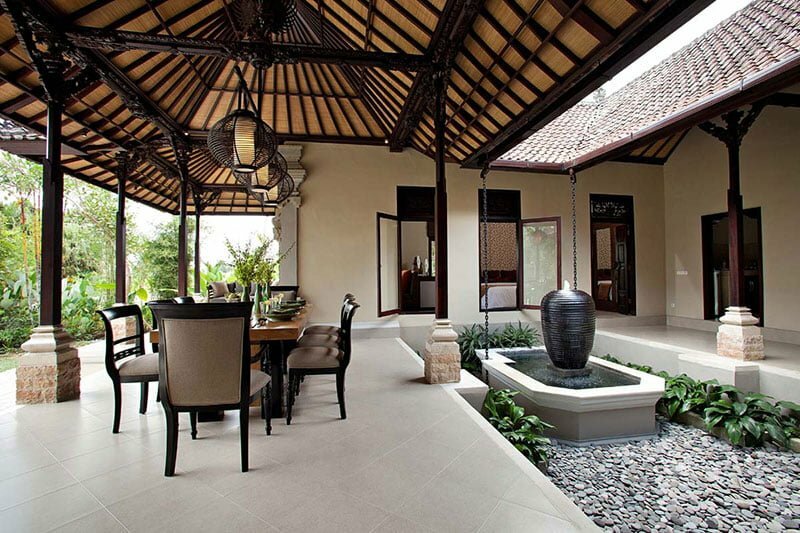 Its design provides for a blend of indoor and outdoor living. 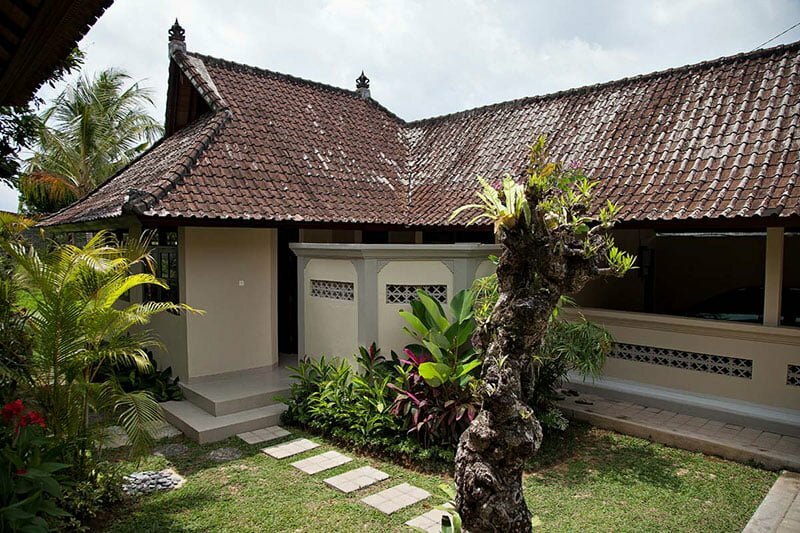 You can opt to kick back and relax on the airy veranda while viewing the rice paddies or lounge in the air-conditioned interior while catching a movie on the television set. 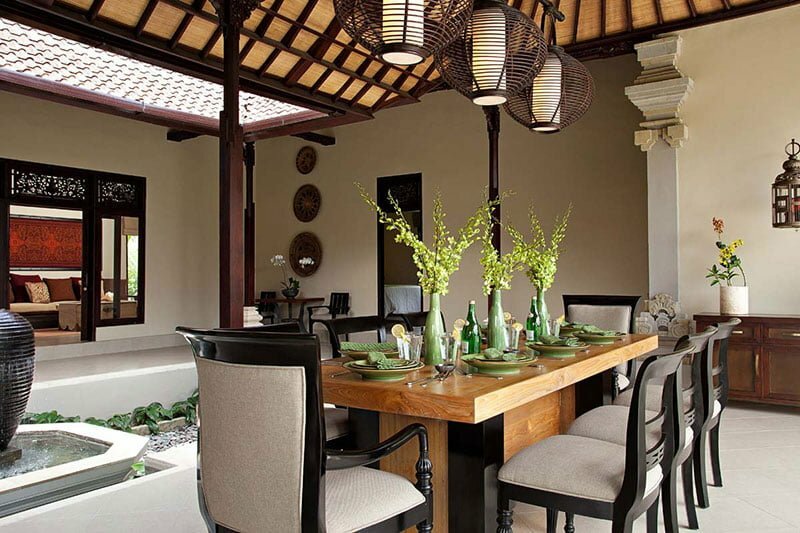 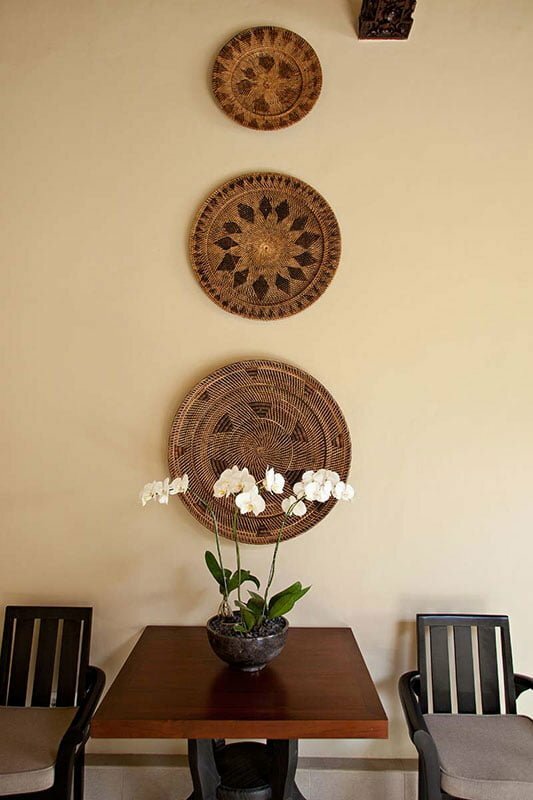 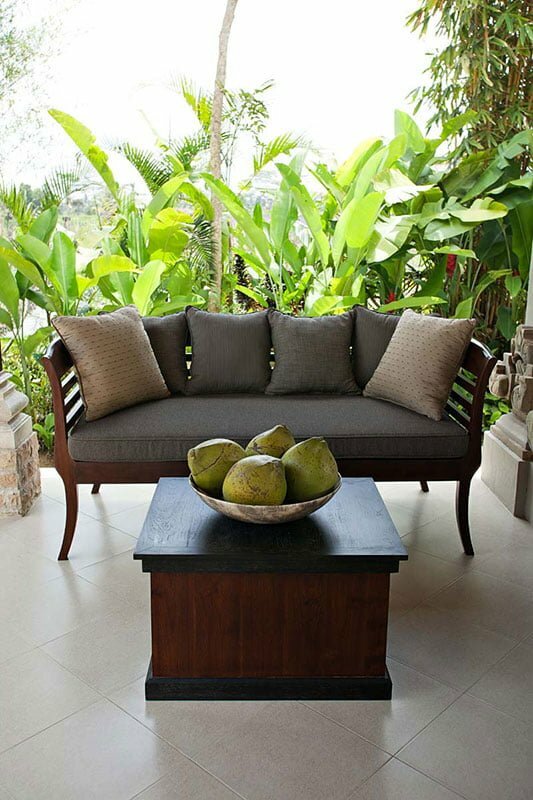 Villa Cemadik’s living spaces are of simple but elegant design with teak wood, tribal artefacts, and traditional fabrics. 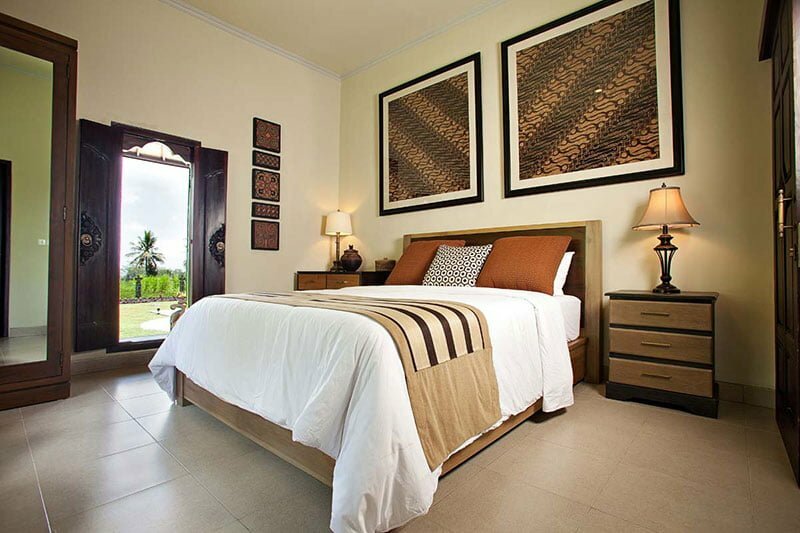 Villa Cemadik’s master suite is air-conditioned and features a large king-sized bed. 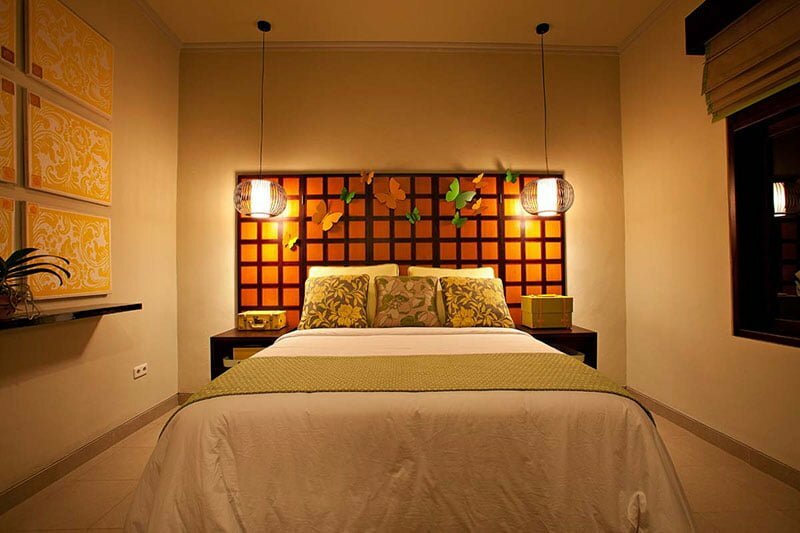 Next to the bed is a sitting area with a TV, where you can catch up on your favorite programs before a comfortable night’s sleep. 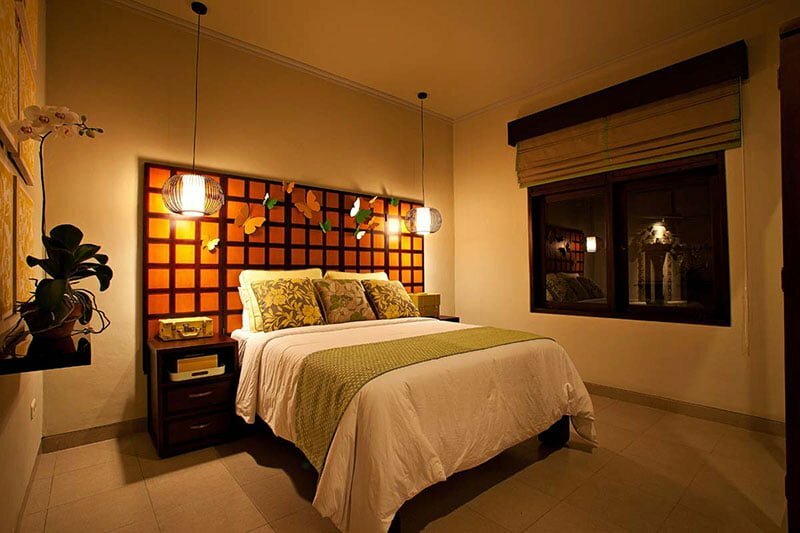 This bedroom opens up to the well-maintained garden where you can catch the morning sun while downing a drink. 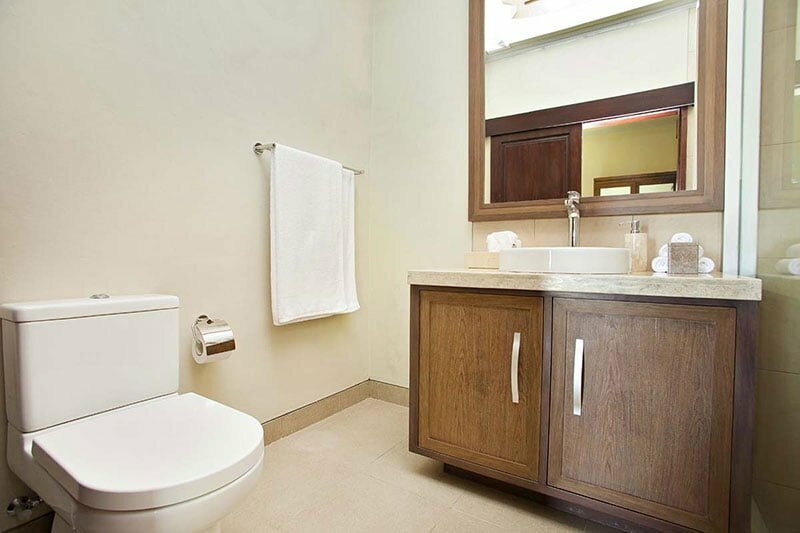 It has a luxurious en-suite bathroom with a bathtub and shower. 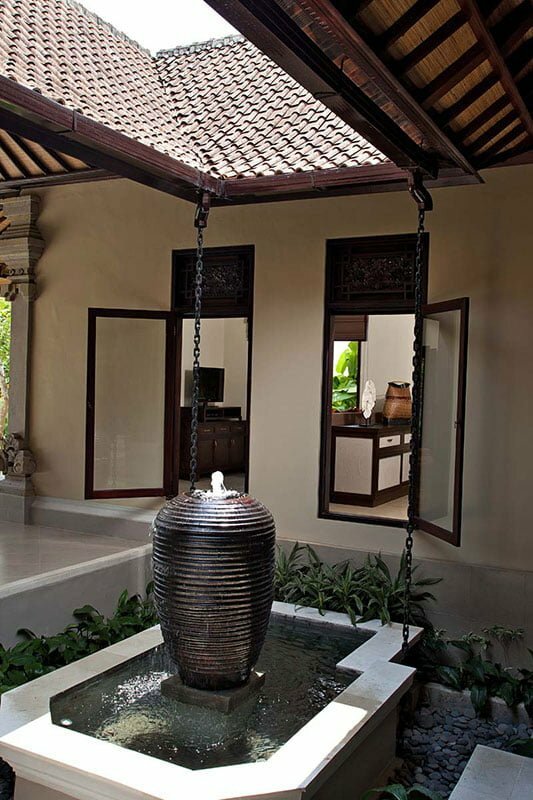 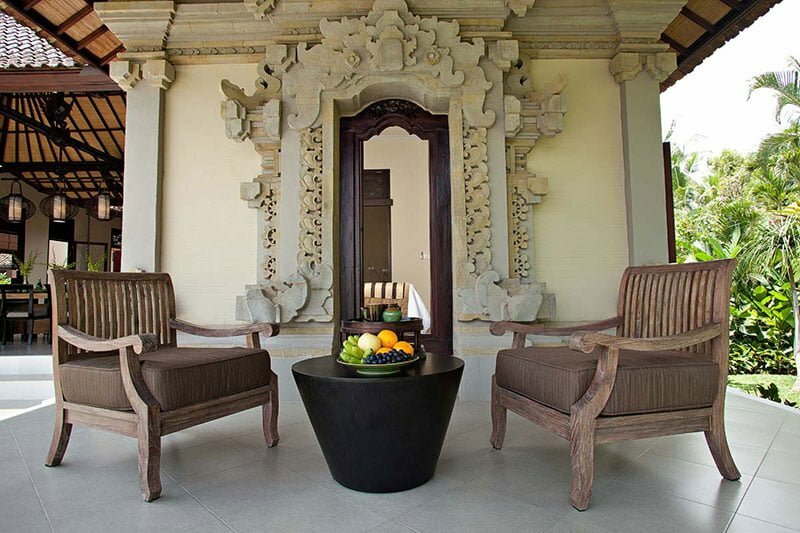 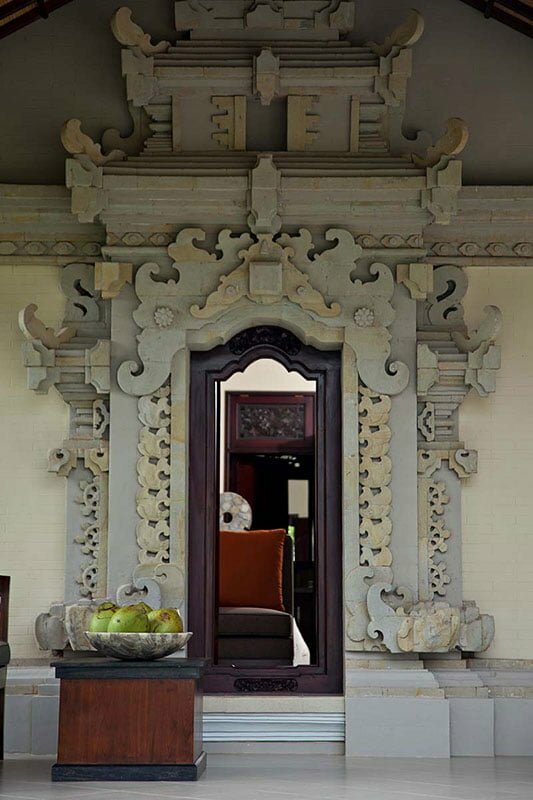 The villa’s 2 guest bedrooms are designed in a Balinese architectural style. 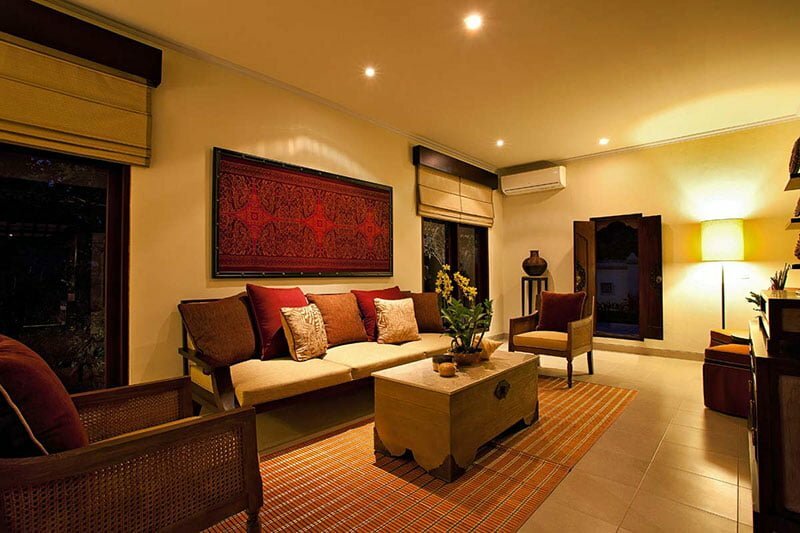 The interior décor is soft and exudes a warm at-home feeling for maximum comfort. 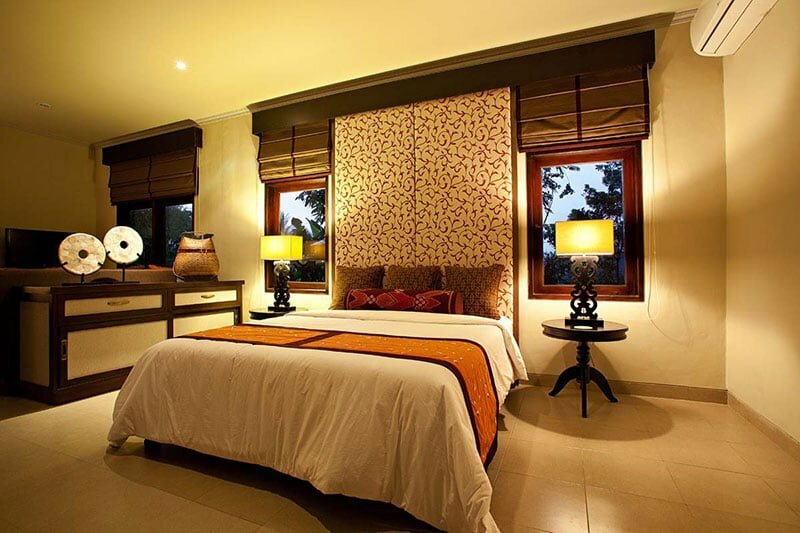 They feature double beds, are air-conditioned and have private en-suite marble bathrooms. 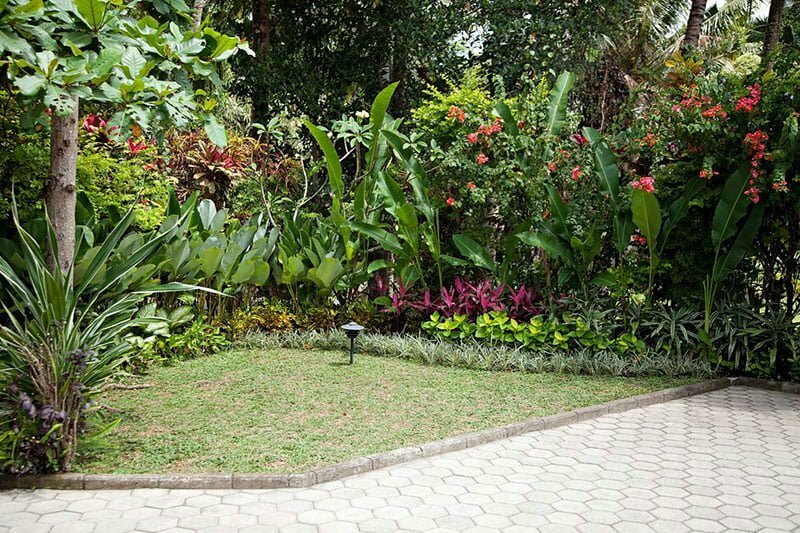 A friendly, welcoming and professional staff that ensures all the guests have a comfortable and memorable stay serve Villa Cemadik. 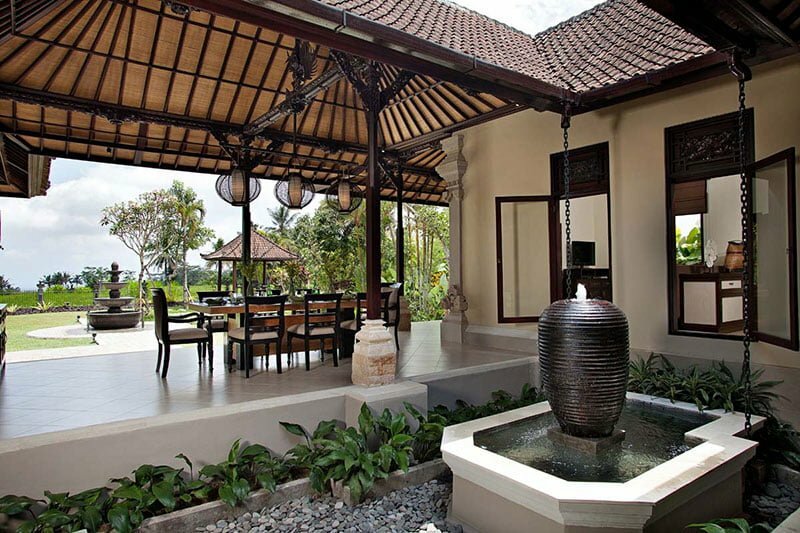 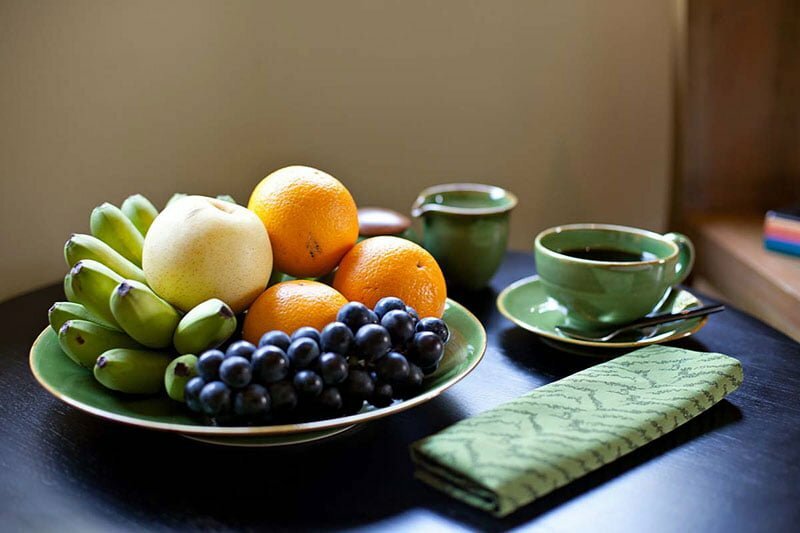 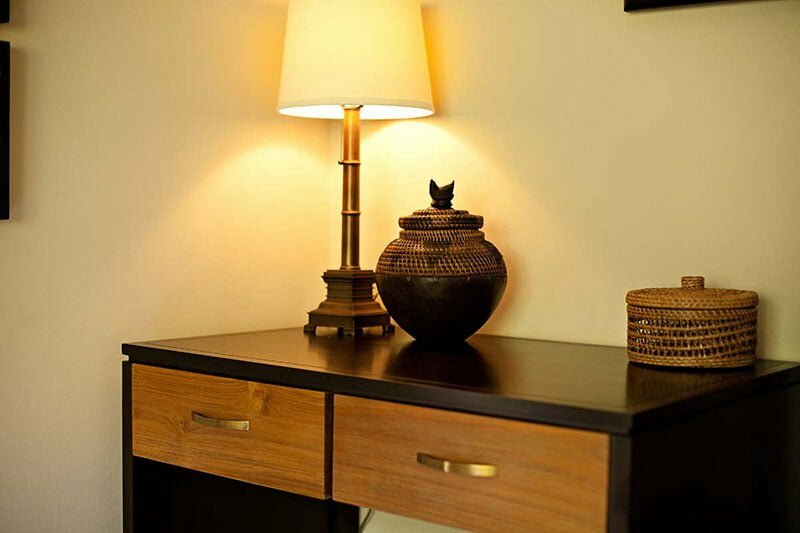 The villa services include housekeeping, laundry, personal butler services, 24-hour security, and a skilled chef.